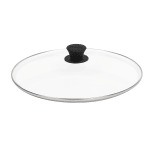 "I've been wanting to purchase this Lodge Pan Lid for a long time and finally did it. KaTom had the best price at the right time for my budget...."
"I am very satisfied with my purchasing experience at KaTom. The order arrived well packaged and undamaged. Katom had the shipment on it's way t..."
"I've been wanting to purchase this Lodge Pan Lid for a long time and finally did it. KaTom had the best price at the right time for my budget. This Lid is beautiful and quality, as I always get with Lodge Cookware. I'm loving it! Thanks so much for a great deal KaTom!" "I am very satisfied with my purchasing experience at KaTom. The order arrived well packaged and undamaged. Katom had the shipment on it's way the same day as ordered and I rec'd the order sooner than expected. I will use Katom for future purchases."